Bearing luscious spring blooms in shades of lemon, cream, salmon, and tangerine, daffodils are the antidote to a long, dreary winter. If you've only known daffodils as unnamed drifts in forgotten farmsteads and roadside meadows, you might be surprised how diverse the Narcissus genus is. Expand your spring landscape palette with a variety of daffodil hues, forms, heights and bloom times with these favorite cultivars. Just like its French pastry namesake, 'Petit Four' is a tasty treat for the spring garden. This daffodil falls into the division 4 category; all that means is that extra petals grow on the flower, giving it a fluffy appearance, more petal power for your floral arrangements. 'New Baby' daffodil is a miniature variety that looks fantastic in spring hanging baskets or containers, or anywhere you can appreciate the unique yellow-edged petals and sweet fragrance. Although the flowers are very petite, the fact that you get between three to four flowers per bulb multiplies your blossom quotient very quickly. 'Crewenna' daffodil falls into the division 1 category, which is the classic trumpet form that appeals to many gardeners. This daffodil is very early, appearing in March in spite of come-and-go frosts and freezes. It's also one of the taller varieties, making a nice visual from across the yard on 26-inch stems. A true red tone has yet to be achieved by daffodil breeders, but 'Red Devon' comes pretty darn close. Bred by an English hybridizer, the name comes from the red cattle of Devonshire. A large-cupped variety, 'Red Devon' received the Award of Merit in 1985 for its show-worthy qualities. Daffodils with a split-cup collar like 'Valdrome' fall into division 11. This daffodil almost has a day lily quality to it, as if a prelude to what summer will bring. In fact, 'Valdrome' is a late variety, often waiting until May to reveal its frilly glory in full. The tall, fragrant flowers of 'Sir Winston Churchill' are worth the wait, appearing in late April or early May. Bulbs average four flower stems each, and the double blooms are lovely as cut flowers. In the 1950s, the Irish daffodil breeder J. Lionel Richardson developed a series of double flowers with exotic names, including 'Tahiti.' He was especially fond of daffodils with deep orange in their cups, providing a striking contrast to their brilliant gold petals. Ask any gardener about the fragrance of paperwhites, and you're sure to get an answer as strong as the flower's famed aroma. Is it funky, or skunky? One feature of paperwhites that everyone is sure to agree on is that they're super easy to grow indoors, requiring neither forcing or even soil to produce brilliant white flowers after several weeks. A brilliant white daffodil like 'Toto' is just the accent to stand in contrast to purple, red, or pink flowers in the spring landscape. The graceful flowers are sun-proof, but they really shine in dappled shade under deciduous trees. 'Ice Follies' produces robust flowers on tall two-foot stems early to mid-season, its yellow frilled cups in perfect proportion to the six snow-white petals on each sturdy stem. You may see fields of this classic daffodil in bloom if you visit the Netherlands, where 'Ice Follies' was bred. Division 6 daffodils like 'Rapture' have a very distinct protruding cup and are usually among the earlier daffodils to appear in March. The lovely sulfur-lemon flowers grow one to a stem on dwarf, 12-inch plants, and have a nodding growth habit that is very pleasing along the front of the garden path. Daffodils like 'Mary Gay Lirette' are redefining the aesthetic this bulb can bring to spring garden design. The color pink was always a relative term in daffodil breeding, usually leaning more towards apricot or salmon, but this 2013 introduction is as pink as any daffodil you will find. Its extremely ruffled and frilled split-cupped collar makes it nearly unidentifiable as a daffodil, bearing more of a resemblance to a peony. 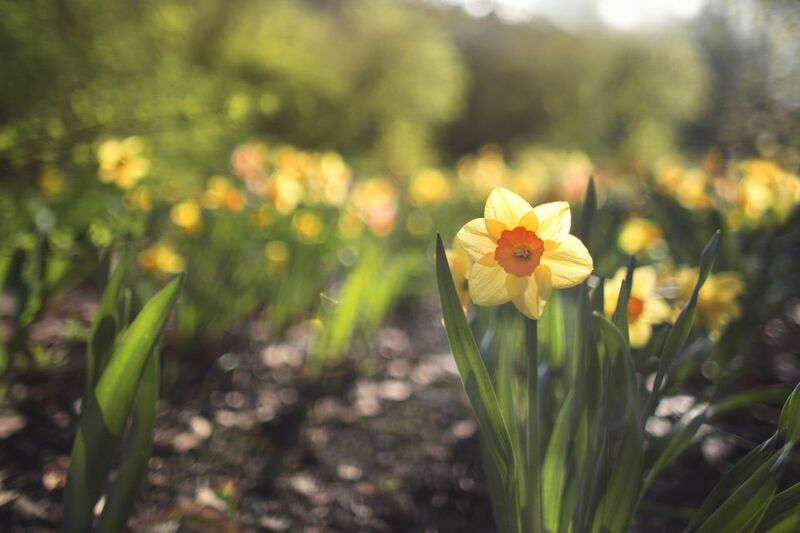 Also known as King Alfred, 'Dutchmaster' daffodil bulbs are the number one cultivar produced worldwide. The 14-inch gold flowers multiply freely into clumps over the years, making them ideal companions in a naturalized wildflower meadow. As the perennial wildflowers emerge, they will hide the fading flowers and foliage of your daffodils. Sometimes it isn't the big and flashy that we crave, but the small and familiar. The Actaea daffodil, Nacissus poeticus, brings feelings of nostalgia for many gardeners. You will never tire of its free-flowering nature and its ability to multiply quickly into large but never invasive colonies. 'Professor Einstein' gives gardeners a striking large flower of substance, featuring a waxy dark orange cup against a glistening white perianth. The flowers have a pleasant fragrance, but deer shun these blooms as they do all daffodils.